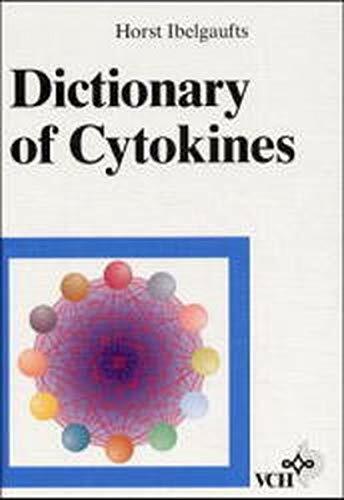 The Dictionary of Cytokines provides concise yet comprehensive coverage of such diverse topics as - alternative nomenclature, - sources and targets of cytokines, - protein characteristics, - gene organization and chromosomal location, - related factors and factor families, - receptor structure and expression, - biological activities in vitro and in vivo, - assay systems, - cytokine studies in transgenic animal models. This 800+ page dictionary comprises ca. 3200 extensively cross- referenced entries, ca. 14000 primary references and reviews, and more than 100 full color illustrations. It guides the user through the zoo of factors, the jungle of interactions, the morasses of acronyms, and the desert of synonyms. The book will be an invaluable aid for the growing number of clinicians, scientists and advanced students of immunology, hematology, oncology, endocrinology, biochemistry, cell biology and molecular biology confronted with the necessity of coming to terms with this key area of interdisciplinary research. This book, written by a single author, integrates much primary information and summarizes essential features in more that 3,200 entries. It is more than a mere collection of growth factors. It is a guide through the zoo of factors, the jungle of interactions, the morasses of acronyms, and the desert of synonyms, and also explains significant terms, procedures and processes encountered in cytokine research.